Ally thinks because it is raining there is nothing to do. Wrong! An outdoor adventure with her mother and grandmother helps her discover a whole new world. A colorful world swirling with the colors of umbrellas reflected in sidewalk puddles unfolds before her as well as the twisted rainbows caused by oil drops on city streets. She discovers worms who love rainy days because their skin needs to stay wet all the time. 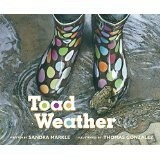 This isn’t just any story to entertain readers about a rainy day it is based in researched science. This book will fulfill the core curriculum standards in natural science, environmental science, climate changes and even migration. When they find the traffic stopped and investigate further they see toads, toads and more toads in a mob trying to cross the highway. The police have a detour set up and people are even picking up the toads and carrying them across safely. Sandra Markle does a great job of including all the senses that children use to learn about their surroundings, well, not taste this time. But the sound of rain pounding on buildings and umbrellas, as well as the sight, is important for children to notice. The illustrations of Thomas Gonzalez mimic the colors and textures of a rainy day. It is amazing how the puddles on the front cover give the 3-D impression that once you touch the cover, your fingers will be wet. And the toad looks like you can reach out and pick it up. This is a great book for teachers, librarians, and parents to use for teaching science skills as well as explaining how many things there are to enjoy on a rainy day. It is so much fun there is no way kids will only want to hear it read over and over again on only rainy days. Second grade and third grade readers will be able to read and enjoy this book on their own. Extras: The author’s note at the end of the book explains a real toad migration that happens each spring near Philadelphia, PA.